This is a custom tile for use with Carcassonne: Cult, Siege & Creativity. Print the tile image below to an adhesive label, such as Avery 6572. Place the sticker on one of the blank tiles that comes with the Carcassonne: Cult, Siege & Creativity expansion pack. The circus is in town. 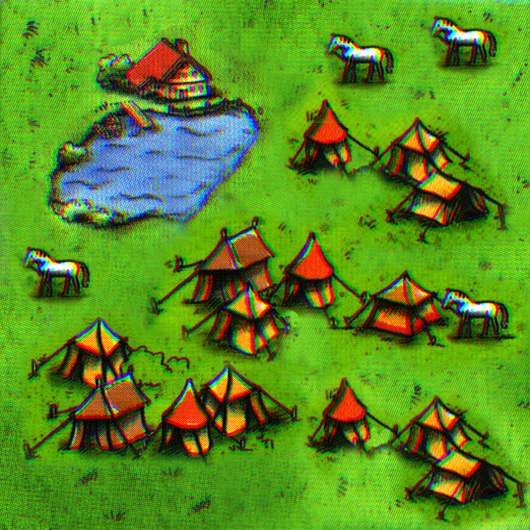 Will the lure of it's bright colors and sounds be too much for the local farm hands, thieves and knights to resist? Play this tile as you would any other tile, except that you do not play a meeple from your meeple supply on it. Instead, move one of your meeples from any other tile onto the circus tile. Score the meeple as it would be scored at the end of the game. Your meeple remains at the circus until another one of your meeples score. When your next meeple scores, return the circus meeple to your meeple supply. Original artwork copyrighted (c) by Hans im Glück, Rio Grande Games, and Doris Matthäus.